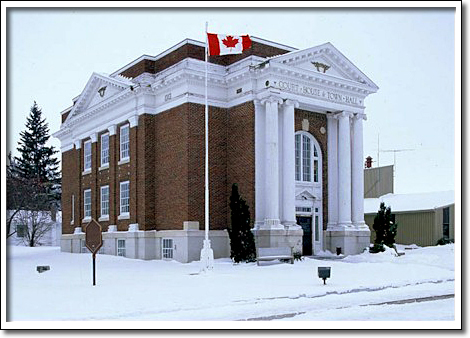 This splendid example of a small Neo-Classical style municipal building was designed by the John D. Atchison Company of Winnipeg. Erected during l9l7–l8 by general contractors Grey and Davidson, it remains one of the outstanding buildings in Emerson. This was the last court house built during the great settlement boom of l880 to l920. The many uses of this structure—town offices, a court room, registry office, a gaol, and theatre—has ensured an economical building for a small and important regional centre. The building was officially opened on July 29, l9l8. The Emerson Journal considered the new edifice, with its Ionic columns, to be a "crackerjack and a credit to the town and community."